So i’m only a fan of DIY when you really can do it yourself well. For instance I can sew pillows and drapes because those are straight simple seams, but i don’t attempt clothes (anymore, although every project runway season I waste so much money on fabric, convinced that I too can wear my own designs, and I can’t, I can’t, I can’t). You have to know your limits. The last question you want is, ‘oh, did you make this?’, because the whole point is to make it look like it was professionally done, or it just came that way. But some simple stuff anyone can do. 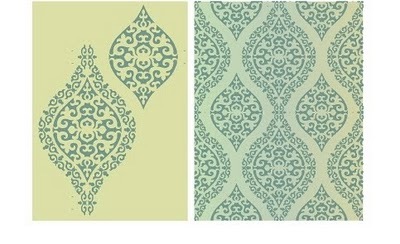 I’ve been shopping a lot for wallpaper lately and I get sad that being a renter, I can’t have any myself on my own walls. 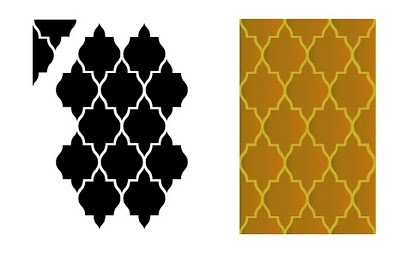 I want a pattern on my wall right now, so I found these wall stencils – sounds scary, I know, but I think with the right colors – this is crucial – and the right finish (matte, glossy) it could look super chic. These all came from the dorkiest stencil website ever, Stencil Planet, you will have to wade through a lot of fish borders and rose decals to find these, but I think they are pretty cool. Choosing the color is SUPER important because these could go really granny and dorky really fast. If you get a lot of light on the wall, I might even to use matte paint for the wall, then the same color in glossy on top. 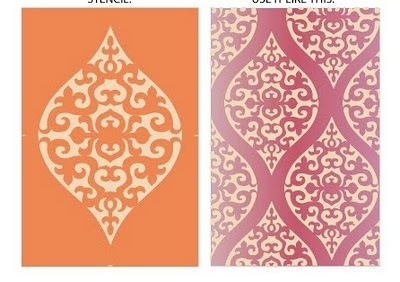 It would just add a texture and another layer of interest without being a crazy pattern.